I am continuing to have a lot of fun and adventures on the East Coast. Friday night Uncle Dan, Aunt Edie, and I had to stack wood into Uncle Dan's pickup truck to take the wood to his neighbor in Hacks Point, Maryland. Several very large tree limbs were broken off a big tree in his front yard by the weight of heavy snow. Uncle Dan had to cut up the wood and get rid of all of the leafy stuff and what was left is what we took to Hacks Point. It was dark when we loaded the truck so I don't have any pictures of that adventure. We arrived in Maryland around 9:00 PM and I was beat. Uncle Dan took me upstairs and put me to bed in a bunk bed. I slept on the top bunk way up high so I had to be careful not to roll out of bed. We woke up Saturday morning in Maryland looking out over the Bohemia River. The next picture is what you can see from the upstairs outside balcony overlooking the river. It was very pretty, but it is late fall, so it is starting to get cold and most of the boats are out of the water for the winter. After a nice breakfast, Uncle Dan said that we had to get to work. We went over to Mr. Dave's house in the truck where we had to unload the wood. I wore heavy work gloves, but that was hard work. My back was tired after we got it all unloaded. After the truck was unloaded, Mr. Dave showed me how he uses a log splitter to make the wood fireplace sized. The next picture is Mr. Dave starting the splitter. If you look really hard you see that the splitter has a capacity of 31 Tons. I never gave it much thought but 31 tons is equally to 62,000 pound of force. That is equivalent to the weight of 20 of Uncle Dan's pickup trucks. I helped Mr. Dave put a big log unto the splitter and he split it into useable sizes. It was amazing how the splitter made the job easy. Mr. Dave reviewed all of the safety features of how to use the splitter safely. With a machine this powerful, it is easy to get hurt if you don't follow the safety rules. After we worked on the wood pile for a little while, Aunt Edie, Uncle Dan, and I took a run to the Post Office in Chesapeake City. Uncle Dan is the Treasurer of the Hacks Point Community Association and is responsible for paying their bills. So every Saturday, He needs to check his Post Office box for bills. While we were out, we did some shopping and sightseeing. On our way out, Uncle Dan took a picture of me and Aunt Edie in front of their house. On the way to the store we had to cross over a really high bridge that went over the C & D Canal. The Canal connects the Chesapeake Bay to the Delaware bay. The history of the Canal is very interesting. The Canal was originally dug in the early 1800's to make it possible for ocean going ships to traverse from the Atlantic Ocean and/or the port of Philadelphia to reach the Upper Bay without having to enter the Bay at the Port of Norfolk Virginia and then having to travel hundreds of miles to reach the Upper bay. The original Canal was about 14 miles long and had Locks in it to lift boats up because the water levels of the two Bays are different. There is a C & D Canal Museum that has one of the old steam engines that was used to pump water into and out of the Locks. In the 1900's the Canal was straightened, widened, and the Locks were eliminated. Uncle Dan told me about how they have run their boat all the way through the Canal into the Delaware Bay. He tells of crossing under 7 bridges that cross over the Canal. One of the bridges is a railroad bridge. The Bridge in on an elevator with huge chain links the size of Uncle Dan's pickup truck and counterweights weighing hundreds of tons, that lift the bridge up and out of the way when no trains are coming. Uncle Dan also talked about how they suspended a pipeline way above the Canal so that they could pump drinking water to the other side of the Canal. All of the bridges that cross over the Canal are very high and don't have support pillars in the water. It seems that over the years in fog and bad weather any bridges that had supports in the water were run into by ships and damaged. The Army Corps of Engineers is responsible for maintaining the Canal and all of the bridges that cross over it. Did you see the orange and white boats under the bridge in the Canal? They are the pilot's boats. Every big ship that crosses through the canal must be piloted by an Army Corp of Engineers pilot. He is responsible for the safe passage of the ships through the Canal. The pilots get on the ship at one end of the Canal and exit at the other end. The boats take the pilots out to the big ships and back. The Canal is seventy feet deep so very big ships can cross through it. Going into Chesapeake City, Uncle Dan took a picture of me looking at he Welcome sign. Chesapeake City dates back to the early 1800's and has many really old houses and shops. It seems as though the merchants are trying to have the city look like a version of Williamsburg Virginia, where the atmosphere and surroundings take you back to how the original settlers lived in the town. On the way back We got to take a picture of the upper Bohemia River. Uncle Dan told me about how several hundred years ago the Bohemia River was inhabited by the Bohemia Indians. They lived along the river because it was full of Fish, Clams, Crabs, etc. Uncle Dan's neighbor Angie Hewes and her kids would walk along the edge of the river and look for Indian Arrowheads. People still find an occasional arrowhead left from the Bohemia Indians. You will remember that Uncle Dan and I shopped at Lowes for some plumbing parts. When we got back to the house, he decided that we were going to fix the plumbing. He is a slave driver. I was ready for a nap and he wants me to help cut, glue, seal, and install new piping in the basement. The next picture is how the plumbing looked before we fixed it. We have city water so I never saw how people who get their water from a well have to have things plumbed. It really is quite complicated. What makes Uncle Dan's situation more interesting is that he shares his well with a neighbor. After about an hour's work, we finished the plumbing job. Guess what, we had water! I love it when a plan comes together and works. Next I went upstairs and found Aunt Edie working in the Sunroom writing a Lotus Notes 8.5 manual. I decided to help her for a while. it sure seems as though all Uncle Dan and Aunt Edie do is work, work, work! No wonder they are looking at retirement. I am much younger than them and I am beat and it isn't even lunch time. 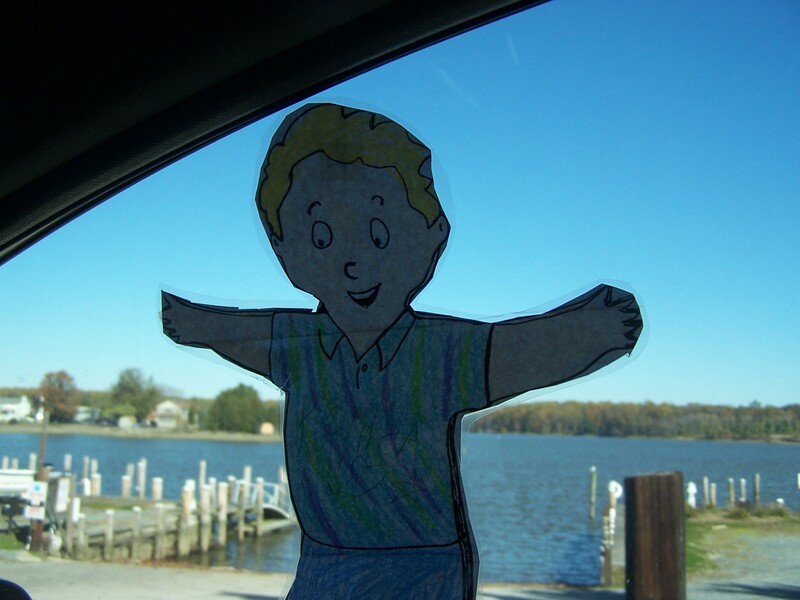 Aunt Edie didn't find me very helpful so I decided to look out the windows at the river and the marina next door. It is such a pretty day, it's a shame to spend it indoors. Later in the day, we met neighbors, Mr. Dave, Miss Betsy, Mr. Gene, and Miss Jeanette at the local VFW for a Meatloaf dinner. We had a lot of fun talking and eating. Look at my plate. MMMMMMM Good. After dinner, I was tired, but do you think Uncle Dan and Aunt Edie would slow down a bit, No Way. We went back to Mr. Gene's and Miss Jeanette's house to play Dominoes. It sounded like fun. Before we started to play games, Mr. Gene asked me if I would like to see his trains. We went down to his basement and checked them out. Before we went into the train room I spotted a fish mounted on a plaque. As I approached it started to kick and sing. I took a movie of it and it is in a link below. I may take a few minutes to download. Check out my singing fish movie. Click Here. I couldn't believe my eyes when we entered the train room, WOW what a neat setup. Mr. Gene is a serious collector of O gauge Lionel trains. I wanted to get up high to look down on the train platform. I looked up to the ceiling and I saw a hot air balloon. I jumped and grabbed the basket and watched as the trains went by. Wow, What a View! Mr. Gene let me walk around the village while he ran the trains. Look what I found he has a sign for the name of the town Owensville. Mr. Gene's last name is Owens, what a coincidence. Mr. Gene even let me drive the trains. I put on his hat and off we went. I even took a movie of the trains running. Click Here to see the Movie. Listen hard and you can hear the train whistle blowing. Mr. Gene also has some collectible Lionel Train Posters and Railroad Patches. I think I want to be a train engineer when I grow up. Look at the Patch Display. My last look at the trains includes Aunt Edie and Miss Betsy looking over the huge train display. I want to do this when I grow up. Our last adventure of the day was to play Dominoes with these cut throats. It is amazing how these sweet people could turn so ugly when it came to playing a game. We played Chicken Foot and they never let me win. For that matter they really beat up on Mr. Dan. He played with the best strategy, and always got blocked. Check out this game board as we play. Did you ever see so many Dominoes? Uncle Dan warned me about Mr. Dave. Look at that face after he went out sticking all of us with a mountain of points. We had a lot of fun. I learned how to count to 130 because of all the points I was stuck with. I understand why Aunt Edie and Uncle Dan like Hacks Point. They have some very nice friends who made me feel welcome and a part of their family. Well I had a really long and hard day and I am really tired. I am going to go to bed now.